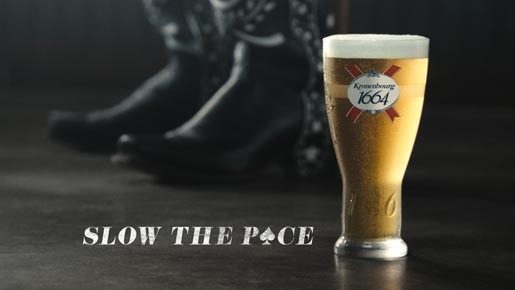 Kronenbourg 1664 has launched a new phase in the Slow The Pace campaign in the UK with a commercial featuring a slow version of “Baggy Trousers” by 1980s pop group Madness. The Slow The Pace campaign, encouraging people to savour Kronenberg 1664 beer slowly, involves national TV adverts, a short documentary film, a print campaign, and social media through YouTube, Twitter and Facebook and continues to promote the notion that Kronenbourg 1664 should be savoured slowly. The first commercial, launched in October 2010, featured Motorhead slowly performing Ace of Spades. Kronenbourg 1664 worked with Absolute Radio to invite members of the public to guess the next band in the campaign, vying for a trip for two to Paris. The Kronenbourg 1664 Slow The Pace campaign was developed at BBH London by creative director/art director Matt Doman, creative director/copywriter Ian Heartfield, agency producers Michelle Kendrick (Ace of Spades) and Georgina Kent (Baggy Trousers), digital producer Alice Bullimore and Tove Svensson, team manager Nic Manser, team director Helen James. Filming for Ace of Spades was shot by directing duo Thirtytwo (Dylan Southern and Will Lovelace ) via Pulse Films with producer Mark Harbour, and director of photography Manel Ruiz. Sound was produced by Jack Sedgwick at Wave Studios. Post production was done at Absolute Post by producer Lisa Vaughan. Editor was Leo Scott at Speade. Filming for Baggy Trousers (Madness) was shot by director Andy McLeod via Rattling Stick with director of photography Franz Lustig, producer Kirsty Dye and production designer Jaroslav Bonish. Post Production was done at Big Buoy and The Mill. Editor was Paul Watts at The Quarry. Sound was produced by Jack Sedgwick at Wave Studios. Photographer was Hamish Brown.